Our pilgrimage journey to Israel to walk in the Footsteps of Jesus Christ starts with our flight to Tel Aviv. Arrival at Ben-Gurion airport in Tel Aviv, meet with our guide to be transferred to Nazareth with luxury air conditioned coach–drive approximate two hours time. Dinner and overnight in Nazareth. After breakfast we visit the Church of Annunciation, celebrating Mass here where the Angel Gabriel announced to Mary that she would be the Mother of God,. We will visit St Joseph’s Workshop and Mary’s Well. We will continue to Cana, the site of Jesus’s first miracle. A renewal of marriage vows and blessing of families is a special moment at this site. In the afternoon we cross the plains of Jezreel and drive to Mount Carmel, visit the Stella Maris church where is believed to have been inhabited by Elijah. Dinner and overnight in Nazareth. 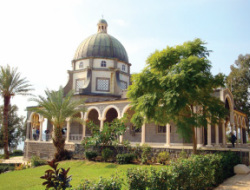 After breakfast, we will drive to Tiberius, visit Mount of Beatitudes where the Lord Jesus preached the Sermon on the Mountain (Celebrate Mass), then we drive down to Tabgha the site of Multiplication of the loaves and fishes and the Church of St. Peter’s Primacy. After Lunch, we enjoy a boat ride across the Sea of Galilee. Visit Capernaum, the new church built at the site of home of St Peter’s mother in law, ruins of the synagogue. Return to Nazareth for dinner and overnight. After early check out, we start the day with a visit to Mount Tabor, the site of Transfiguration. We continue to drive along the coast Plains, visit Caesarea Martima. Then we continue to Emmaus to celebrate mass. We return to Bethlehem for dinner and overnight. After breakfast we visit the Basilica of the Nativity (celebrate Mass), tour the church marking the birth place of Jesus. Visit the Church of Saint Catherine and the St. Jerome caves, where he translated the vulgata. Drive to the Shepherd’s Field in Beit Sahour where the Angel’s announcement of the birth of Jesus is remembered. 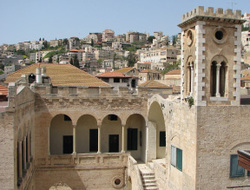 Drive to Ein Karem, visit the Church of Visitation where the Virgin Mary visited Elizabeth, and the Church of St. John the Baptist. Dinner and overnight in Bethlehem. After breakfast we drive to Jerusalem, enter Jerusalem with view of the Holy City from the Mount of Olives following the Palm Sunday road, the Church of Ascension from where our Lord ascended to heaven. 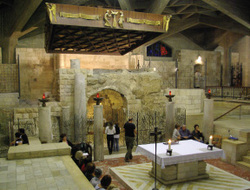 Visit the Chapel of Dominus Flevit where Jesus wept on Jerusalem. Then proceed to the Garden of Gethsemane the Church of all Nations (where we will celebrate Mass). 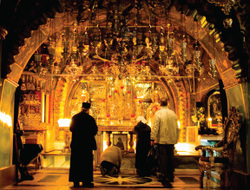 Visit the Church of St. Peter Gallicantu, visit Mount Zion, the room of the last supper, Church of Dormition where the Blessed Virgin Mary fell into a eternal sleep. Short praise and worship service in Upper room, the sight of Pentecost. Return to Bethlehem for dinner and overnight. 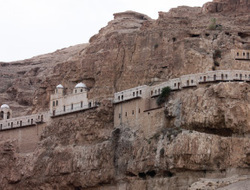 The next day, after breakfast, we drive to Jerusalem to walk along the Via Dolorosa (the way of suffering) starting with the first stations at Ecce Homo and the Chapel of Flagellation, and ending the last station in the Church of the Holy Sepulchre. After lunch, we will have free time in the old city of Jerusalem. Return to Bethlehem for dinner/overnight. This day we will drive to Jericho visit Mount of Temptation, continue to visit Qumran, the place where the Dead Sea scrolls were found. Drive along the Dead Sea the lowest point on earth 1300 Feet below sea level. We make stop on a private beach, take the opportunity to float on the salty water, rich in minerals. We will return back to Bethlehem for dinner and overnight. 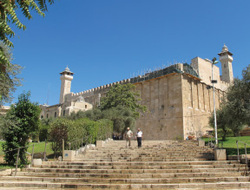 Drive to Hebron to visit the old city, Tomb of the Patriarch and Glass factory. On the way back to Bethlehem we will visit Herodion. Dinner and overnight in Bethlehem. Drive to Ben Gurion airport for departure to USA….ending our journey where we walked in the Footsteps of Jesus Christ.